Everywhere you look in Spain, you will see very old (and new) black, wrought-ironwork…wonderful ornate lamppost, large black gates, and rose-covered balconies! It is found in the Plaza Mayor (or town square), at the Royal Palace courtyard, or along the quiet, tree-lined streets on majestic gates…and the heavy door handles on large wooden doors! In this small wholecloth, quilted piece, a sketch of a typical Spanish design is done in thread by free-motion, machine work vs by hand drawing, pencil on paper~the design is “sketched” using rayon thread and the machine on a single piece of fabric (which was layered with batting and a backing fabric), Using different metallic type fabrics, I have created designs to resemble metalwork. This piece is also part of the Metalworks series. 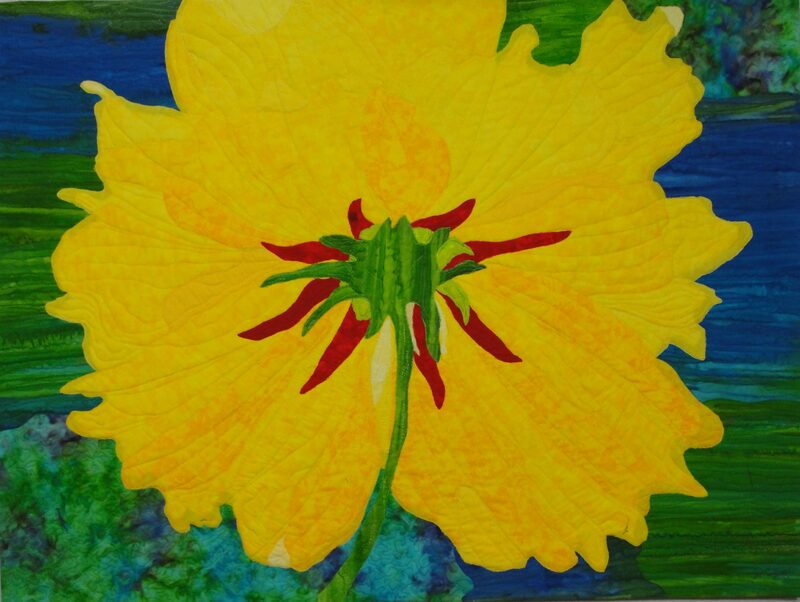 Original Art Quilt, Size 7 1/2″ x 9″. For Collectors of unique, original art or Art Lovers looking for a special, unusual gift!